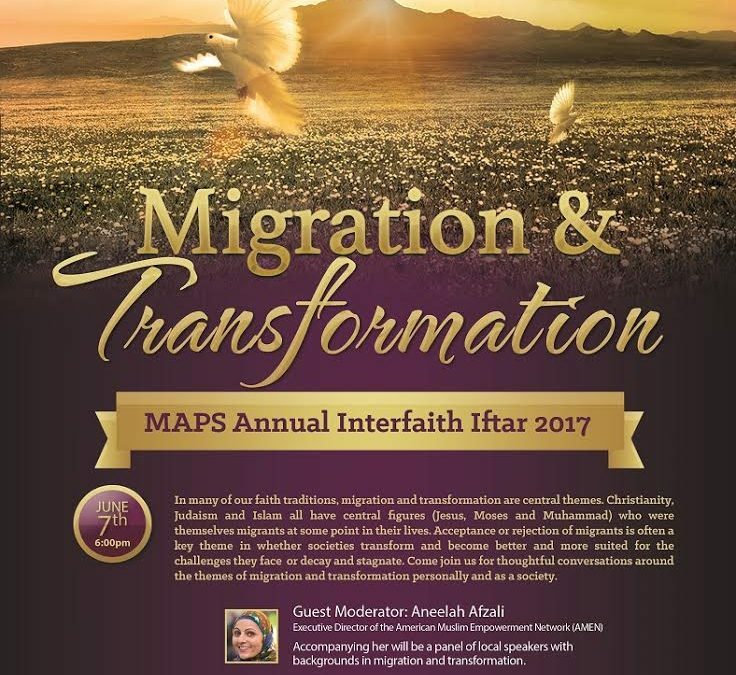 The Muslim Association of Puget Sound presents “Migration & Transformation,” MAPS Annual Interfaith Iftar. In many of our faith traditions, migration and transformation are central themes. Christianity, Judaism and Islam all have central figures (Jesus, Moses and Muhammad) who were themselves migrants at some point in their lives. Acceptance or rejection of migrants is often a key theme in whether societies transform and become better and more suited for the challenges they face or decay and stagnate. Come for thoughtful conversations around the themes of migration and transformation personally and as a society. Guest Moderator: Aneelah Afzali, Executive Director of the American Muslim Empowerment Network (AMEN). Accompanying her will be a panel of local speakers with backgrounds in migration and transformation. No babysitting available. Dinner is served around 9:05 p.m., but snacks for non-Muslim guests will be provided.